~ From upstream to downstream, from wind to hydro and beyond, Foster Marketing delivers cost-effective, creative marketing communications to the worldwide energy industry. The Agency Retreat: Get Out of Dodge or Get Your Act Together…or both. 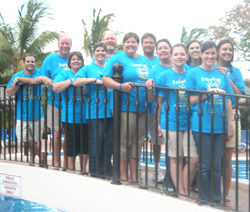 In June, Foster Marketing employees participated in our 14th Annual Foster Fest summer retreat in Playa del Carmen, Mexico. Through the years we’ve taken our staff and significant others to some pretty nice locales. From our first retreat at a plantation home in St. Francisville, La., we’ve now met in Niagara Falls, Chicago, Cozumel, New Orleans and taken numerous cruises out of New Orleans and Galveston. As our team has grown it has become more expensive for this enterprise and a budget challenge for our President, Tiffany Harris, who plans these meetings. However, I wouldn’t trade these four-day events for anything. We always talk about spending 50 weeks working in the business, i.e. working on helping our clients grow, but we only spend a couple of weeks working on the business, i.e. helping Foster Marketing get better. On a retreat, you actually work on your business. Many firms take just their management-level staff on a retreat. I’m a strong believer in taking all the staff – it’s a team. Additionally, we ask every staff member to make a presentation on something of importance to the agency. •The follow-up is lacking after the retreat. •We need to pause and work on the business. •It gets everyone involved in the success of the business. There are many things to think about when planning a retreat, but basically there are five key things to consider – know your purpose, pick a date, select an off-site location, develop an agenda and use what you learn. At Foster Marketing, we have several goals for our retreats – basically those indicated above on why we have a retreat. To pick one goal in particular, I’d say getting everyone involved in presenting solutions is most important to me. Getting the Office Administrator to discuss HR or our Controller to discuss finances or our Trade Show Coordinator and Public Relations Account Executive to discuss their specialties is exciting. In addition to our summer retreat, we have quarterly meetings at Foster Marketing, usually at our office in Lafayette and basically with the same goals. However, our summer meeting, or Foster Fest, has historically been off-site and we’ve been blessed to be able to afford taking our staff out of town. It is an expense, but Tiffany Harris does a great job of finding affordable deals whether by land, sea or air. We’ve done ’em all. The ideal meeting spot should provide a comfortable and unique experience, the necessary working space and equipment, facilities and meal options. For the agenda, we try to have every staff member (now numbering 13) take 30 minutes to present and discuss a pre-determined subject of interest. This is usually a PowerPoint presentation with lots of give and take (many times mine). Invariably, we come out with great ideas. At Foster Fest in Playa del Carmen, we implemented a concept we had used successfully at a prior Foster Fest. We solicited topics/issues from employees to discuss using the Creative Whack Pack by Roger von Oech. The Creative Whack Pack consists of 64 cards, each featuring a different strategy. Some highlight places to find new information. Others provide techniques to generate new ideas. Some lend decision-making advice. And many give you the “kick” you need to get your ideas into action. We used the cards on each topic/issue. It was a great exercise and we came out with an exceptionally large number of ideas. Now, the kicker: A retreat can only be effective if you apply what you’ve learned. Our list from our last Foster Fest is long. The proof of the retreat’s success will be in the pudding of results. Foster Marketing is ready to help energize your marketing programs. Email Jamie Efurd or call 281-448-3435 or 337-235-1848 to schedule a meeting with Foster Marketing to discuss how we can help integrate and enhance your marketing efforts.